The Small HD Focus Bolt RX is a daylight viewable lightweight monitor with built in 500ft wireless receiver with handles. The Small HD Focus Bolt RX is a daylight viewable lightweight monitor with built in 500ft wireless receiver with handles. Just like the original Focus the Bolt RX is a 5-inch touchscreen display at 800 NITs and a resolution of 1280 x 720. 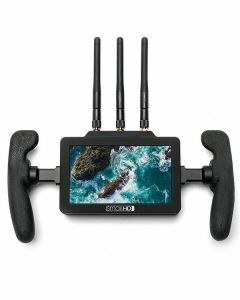 The Focus Bolt RX features a Micro HDMI input and a 7.2v power output and ships with a single L series battery and charger as well as monitor handles and neck strap. The Focus Bolt RX is compatible with the Small HD Focus Bolt TX, Teradek Bolt 500, 1000, 3000, LT and XT transmitters.